MSRP or Price does not include $250 in destination charges. The great outdoors may be an awesome, expansive place, but one of the best ways to see it is on our smallest all-terrain vehicle: the Honda TRX90X. That’s especially true if you’re talking about first-time ATV riders, and younger riders in particular. The TRX90X is designed from the outset to be beginner friendly, but it still has plenty of sporty performance, and that means more experienced riders can have fun too. Because it has such a broad powerband, our proven, rugged single-cylinder, single-overhead-cam engine makes it easier for beginners. Plus, the electric starter makes getting underway a snap. And then there’s possibly the biggest plus of all: the TRX90X features Honda’s no-clutch transmission. They still get to shift gears, but there’s literally no clutch to worry about, and that means no fear of stalling. New riders can concentrate on the fundamentals of control—and just plain fun, too. The TRX90X is an ATV the whole family can enjoy. And since it’s a Honda, you’ll enjoy it for years and years to come. BUMP-ABSORBING SUSPENSION: Up front, independent suspension features a pair of rugged shock absorbers with 2.6 inches of travel for a comfortable, controlled ride. In the back, a single-shock rear suspension delivers all-day comfort with trail-taming handling. KEYED IGNITION: It’s all about being responsible. 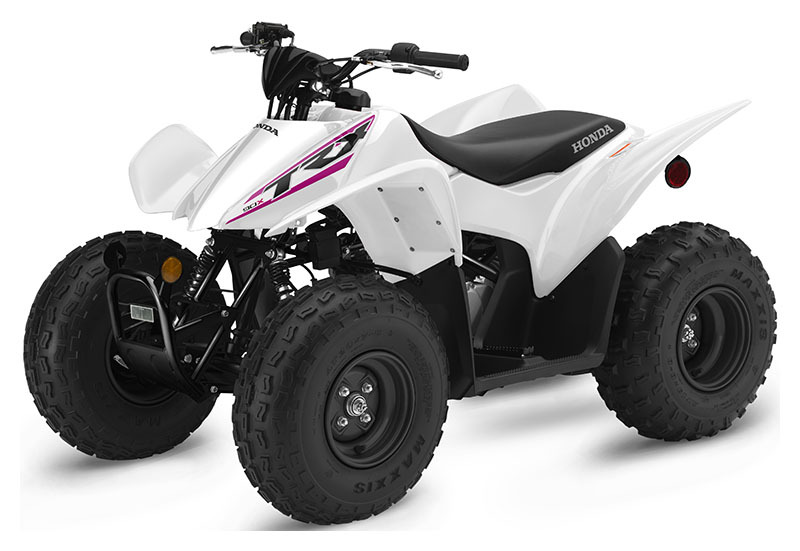 Since the TRX90X uses a keyed ignition, parents control who goes riding and when. And there’s even an adjustable throttle limiter that lets you control top speed and power too. RUGGED 86 CC SOHC FOUR-STROKE ENGINE: Honda's proven 86cc SOHC four-stroke engine offers smooth, useable power delivery and legendary reliability. Convenient, push-button electric starter ensures hassle-free starting in all conditions. SEMI-AUTOMATIC TRANSMISSION: The TRX90X’s durable automatic clutch makes takeoffs and shifting a breeze, while the versatile four-speed transmission is geared to deliver adequate power for appropriate riding conditions. COLOR OPTIONS: Choose between the new White color option with pink stripes in the graphics, Olive with exclusive Honda Phantom Camo® highlights or the classic Honda Red. Plus, they all sport black frames and black wheels too. TRX90X IS RECOMMENDED ONLY FOR RIDERS 12 YEARS OF AGE AND OLDER. RIDERS UNDER 16 YEARS OF AGE MUST BE SUPERVISED BY AN ADULT. ATVs CAN BE HAZARDOUS TO OPERATE. FOR YOUR SAFETY, BE RESPONSIBLE. READ THE OWNER'S MANUAL. ALWAYS WEAR A HELMET, EYE PROTECTION AND PROTECTIVE CLOTHING. BE CAREFUL ON DIFFICULT TERRAIN. ALL ATV RIDERS SHOULD TAKE A TRAINING COURSE (FREE FOR NEW BUYERS. ASK YOUR DEALER OR CALL ASI AT 800-887-2887). NEVER RIDE UNDER THE INFLUENCE OF DRUGS OR ALCOHOL, ON PAVED SURFACES, ON PUBLIC ROADS, WITH PASSENGERS, OR AT EXCESSIVE SPEEDS. NO STUNT RIDING. RESPECT THE ENVIRONMENT WHEN RIDING. TRX is a registered trademark of Honda Motor Co., Ltd.